A Eurostar train at Platform 15 at Amsterdam Centraal station. Preparations are almost complete at Rotterdam Centraal and Amsterdam Centraal stations for the launch of Eurostar’s new service to the Netherlands. On February 20, Global Rail News travelled on the inaugural trip. 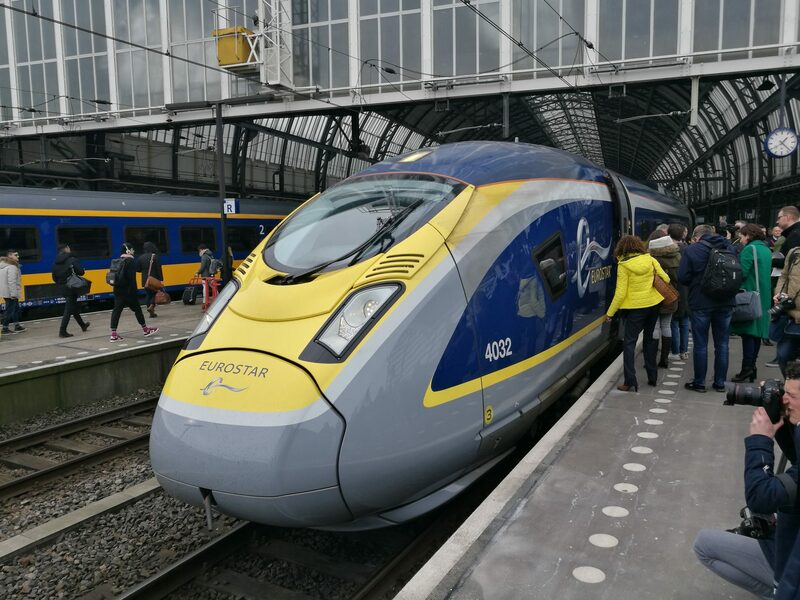 The service did not stop for passengers to disembark in Rotterdam but guests were given the opportunity to look around Eurostar’s new terminal in Amsterdam. Work is still taking place in the lounge but passengers were given a sneak peek ahead of the service launch. The terminal sits on Platform 15 and overlooks the IJ, Amsterdam’s waterfront. Immediately upon entering the building, passengers will head past one of two immigration booths and one of two lanes for x-ray machines on the left hand side, but fittings for these won’t be installed until the juxtaposed controls are in place in 2019. When the service launches on April 4, with stops at Rotterdam and Brussels Midi, a direct route will operate from London-Amsterdam but not on the return leg. Due to agreements yet to be reached between the governments of the UK and the Netherlands, passengers have to stop in Brussels where passport and security checks will take place, rather than them taking place in the Dutch capital. A walk further down the 600m sq terminal reveals the waiting area with standing tables and seated areas, some with charging points, to the right hand side behind a dividing wall. There will be no Business Premier lounge due to space restrictions. Meanwhile, at Rotterdam Centraal station, VolkerRail has been working on Platform 1, extending it by 4m and removing track 1 in the process in preparation for larger passenger numbers. This work will run until March 26. Passport control facilities will also be installed on the platform, including security cameras and dynamic screening. The Eurostar office at Amsterdam CS was closed on the 15th October 2018. No sign of life at all. In fact, no sign of the in-bound Eurostar, from London on that day. We arrived at Amsterdam CS, at about 11.30, to meet my cousin coming in on the mid day Eurostar. The train never arrived, and there were no Eurostar staff available to give any information or assistance. We asked several NS (Nederlandse Spoorwegen) what was happening. Eventually we heard of a problem with the Eurostar at Schiphol. Apparently the passengers had been transferred to normal trains at Schiphol. We asked for an announcement to be made, in English, requesting Ian to meet us at platform 13/14, the normal Eurostar arrival platform. After the announcement, made at around 1500 (I can not remember exactly, as I was becoming rather agitated by this time!). We waited until 1645, there was no sign of Ian or a Eurostar. We took a train back to Roermond. Hopefully Ian arrived, eventually, has found a bed for the night and will contact us today.